As we approach the 100 year anniversary of the beginning of the Great War, The Empty Room has delivered Toronto theatre audiences a tremendous present by remounting R.C. Sherrif’s Journey’s End. World War I was an immense mistake. Missing Journey’s End at The Artisan Factory would be another gigantic mistake. It is an intimate, firsthand glimpse into a soldier’s life during war. Journey’s End is an English play written by an English veteran of World War I. It’s rarely mounted, which is scary. It’s scary because this is a powerful, firsthand account of what may have been the nadir of human endeavors. It’s scary in a good way because this is a tremendous play with a tremendous cast. It’s scary because this is a memory that is fading from our collective unconsciousness and being replaced by what is trending on Twitter this hour. For me the play felt like watching an old episode of The Honeymooners. It’s kind of black and white, written and performed by people with accents different than my own in far away locations. It all happened way before I was born. It may be a giant city like New York or the theatre of battle might be the continent of Europe, but both are very claustrophobic. Whether a dingy apartment or the trenches of France, both settings are filled with characters exhibiting basic and universal human traits. To me, watching Gleason and Carney give me tunnel vision. Listening to them, though, is like a great radio broadcast. Journey’s End has the same effect. There’s something very human, very humane about both. The British soldiers even recognize acts of decency performed by the Germans. As a matter of fact, the acting was so good that I found myself siding against the English. Their uppity nonsense is something that only the English could accomplish. They complain about the food served by a waiter while the Germans are 70 meters away. It’s the sheer lunacy that only a country that shuts down for a month for a royal wedding in the centre ring, face race riots in ring two and economically collapse in the third ring could even contemplate. The events of the play take place over a few days. During a time that is measured in hours, or even minutes, we see the gamut of male bonding vividly and authentically portrayed. Great men become greater but battle with alcoholism. Young men see their heroes as mortals. Their main concern is the quiet. It’s disquieting, deafening as they say. I’ve spoken with Americans who served in Germany in the 60’s. Every day they’d blow up stuff and the Russians would do the same. It was mundane, routine. Then Kennedy was killed and things became silent. Fear set in. I’ve never understood the terror of such silence until seeing Journey’s End. That’s a testament to the actors, all of them stellar. Another thing I liked about this production was the venue. The Artisan Factory is a nondescript venue in a somewhat out of the place in Toronto. A bit hard to find, once inside it is a bit of an anonymous labyrinth. There’s a familiar, unpleasant smell I can’t pin down. Being in the bowels of a warehouse in Toronto, it really does help to put the audience in the mood of being in the trenches of France. Inside the performance space, the set and quiet is perfect. I’ve been to other plays where they have attempted this sort of thing, but they have all fallen far short of success. The Empty Room, with a set that transports us to a long ago time and faraway place, features incredible acting and very friendly front of room staff. They have accomplished the near impossible. The production values are right up there with the theatre you would see on King or Yonge Streets. Seriously, it’s that good. I highly recommend Journey’s End and would see it again in a heartbeat. You should put put down that dodgy electronic doodad and go see it too! 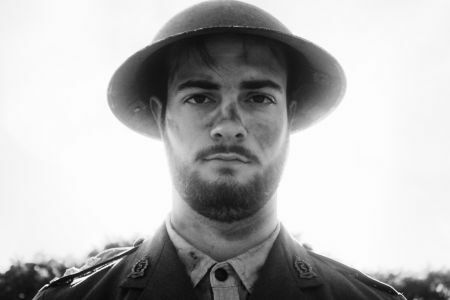 Photo of Andrew Petker as Captain Stanhope in Journey’s End by Patrick Lemieux.